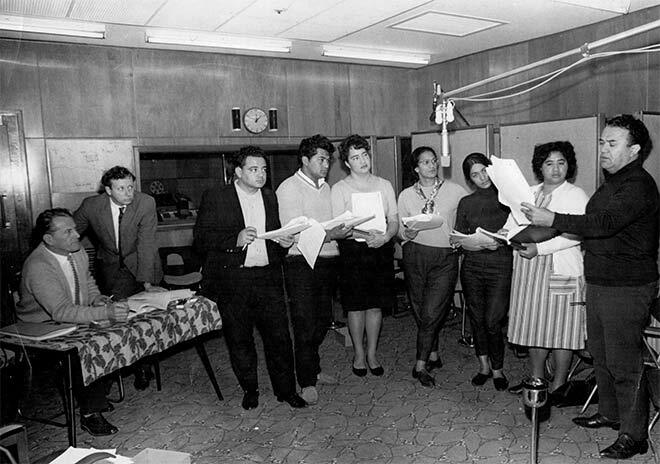 The cast of 'Awatea' record the play in the production studios at Broadcasting House, Wellington, in 1965. Those shown are, from left: William Austin, producer; Bruce Mason, playwright; and cast members Don Selwyn, Sam Stevens, Ngaire Karaka, Hannah Tatana, Diana Winterburn, Newha Taiaki and Īnia Te Wīata. The National Broadcasting Service (NBS) and its successor the New Zealand Broadcasting Corporation (NZBC) produced a large number of radio plays, often written by New Zealand playwrights. Radio dramas provided a good source of employment for New Zealand writers and actors. In this case the play had been commissioned by the NZBC to take adavantage of the visit of opera star Īnia Te Wīata, who was touring the country with the musical 'Porgy and Bess'.